âœ” OVERCOME THE PAIN AND GET HOOKED ON THE GAME! â€“ This 3-in-1 bundle offers you the muscle and joint pain relief you want PLUS the strength-building tools you need to avoid future elbow injury. You'll get the best quality Witkeen tennis elbow brace that provides relief from elbow tendonitis, including tennis elbow, golfer's elbow, and more. You'll also get a 40-lb. 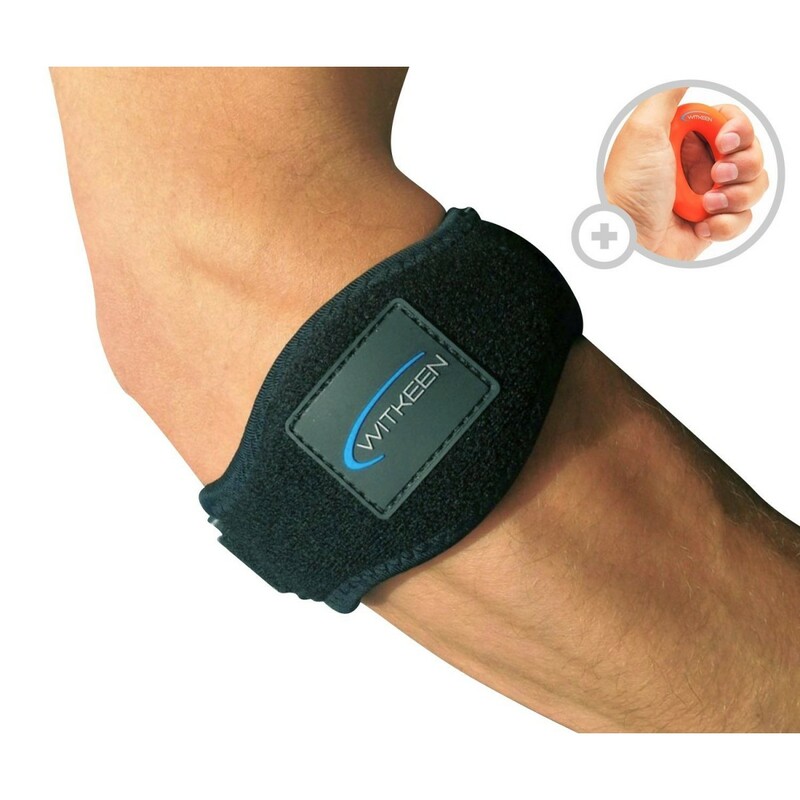 silicone hand gripper that strengthens the muscles and tendons in your arm to prevent future painful issues. âœ” UNBEATABLE DOUBLE GUARANTEE â€“ Have total peace of mind and try out this elbow support bundle RISK FREE thanks to our exclusive double guarantee. Your Witkeen elbow brace and hand gripper are protected by both a MANUFACTURER LIFETIME REPLACEMENT WARRANTY against defects AND our 60-day MONEY BACK GUARANTEE. We're so confident that we want you to test drive both products for 60 days. If you're not satisfied for any reason, just let us know and you'll receive a full refund. âœ” Comfortable Elbow Support â€“ Tired of uncomfortable, ill-fitting elbow braces that just make things worse? You'll love our superior quality compression pad that is firm enough to provide adequate support to elbows but also soft enough to keep you comfy no matter what you're doing. 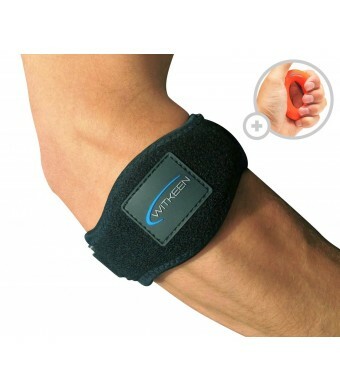 This elbow brace will also keep your injured forearm warm while it promotes quick healing! âœ” Highest Quality and Best Value â€“ We focus on delivering the best tennis elbow brace on the market at affordable prices. That's why you're getting the highest quality tennis elbow brace made from 80% neoprene and 20% nylon and a premium 100% silicone hand gripper in one package. Plus: As a FREE bonus, you'll get an e-guide that includes the most effective exercises for rebuilding the strength in your elbow and forearm so you can recover faster and prevent chronic injury! âœ” Versatile and Easy-to-Use â€“ The 2-strap design of this tennis elbow brace makes it easy to use and adjust. One size fits most forearms (up to 14 inches). This hassle-free, versatile elbow support brace is perfect for men and women and great for all types of sports, including tennis, golf, basketball, weightlifting, and much more.